Now that you have got those wonderful violet streaks or dark purple highlights in your hair, you are ready for the party tonight! Right? Not completely. Here's something most people forget or are unaware of! The purple streaks or any color treatment on your hair should remain for more than just one day. Are you wondering what this is supposed to mean? This simply means that if you don't use the best shampoo for color treated hair then you will lose the streaks quite quickly. 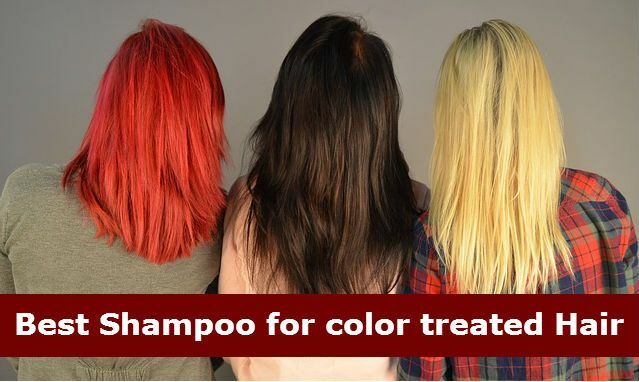 What you really need is a shampoo that will not only preserve the freshly done color but is also safe for colored hair. After all, you would not want to visit the top salon in town, spend money and end up losing hair color. Hence, it is important to choose the right shampoo and hair care ﻿﻿products, which you can use at home, so that your streaks and colors keep making the right fashion statement. The question is how to choose the best shampoo for color treated hair. In order to make life a little easier, we have gone ahead and conducted in-depth research, so that all you have to do is choose the shampoo that is perfect for your hair needs. Let us take a look at the list of 6 best shampoos for colored hair. 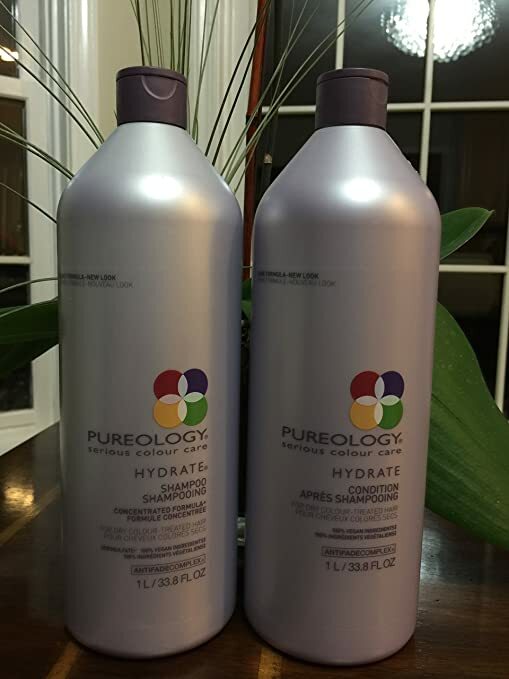 If you are looking for a shampoo that is safe for color treated hair and also provides the necessary hydration that your hair and scalp require then Pureology hydrate color safe shampoo is what you need. The Pureology hydrate shampoo is considered as one of the best shampoo for colored and color treated hair as it contains a blend of natural ingredients. Apart from this, it has been created using a patented formula or system known as the hydrate system. At the heart of this system is the need to gently moisturize and cleanse your hair while ensuring complete protection of hair color. It not only protects hair color vibrancy but is also safe for colored hair and leaves it with a satin and luxurious look and feel. The Pureology hydrate shampoo contains several natural ingredients including Sandalwood, Patchouli, Rose, Soy, Green Tea, Ylang Ylang, Anise, Wheat, Oat, and Bergamot. The Pureology hydrate conditioner contains natural ingredients like Peppermint essential oil, Shea butter, Rosemary, Jojoba Esters and Sage among others. Signature Blend: The Pureology hydrate shampoo is not just a moisturizing shampoo but will also let you enjoy a moment of Aromatherapy thanks to the smooth blend of Corn Mint and Peppermint essential oils. Zero Sulfate: The patented ZeroSulfate system is an integral part of the Pureology hydrate shampoo. The ZeroSulfate system comprises of a color-preserving formula that has been derived from naturally available food like sugar, corn and coconut. This is one of the primary reasons why this hydrate shampoo is in our list of best shampoo for color treated hair. Handles dry ends and oily roots and helps in strengthening of hair roots. What makes the Enjoy luxury shampoo different from other hair shampoos? This luxury shampoo has been created using a color safe formula, which means it is going to protect your hair color. The Enjoy luxury shampoo is a sulfate free shampoo that is considered to be extremely safe for colored hair. Enjoy luxury Shampoo is in second spot on the list of best shampoo for color treated hair. One of the main ingredients of the enjoy hair care color protecting shampoo is Keratin Amino Acids (90-150MW). Keratin is a naturally occurring mineral in the hair and this shampoo provides more of it so that it can penetrate deeper into the hair follicles and repair any weak and over-processed hair. The good news is that Keratin Amino acids also play a key role in eliminating frizz while ensuring longevity of your hair color. Another important ingredient of the Enjoy luxury shampoo is Sodium Cocoamphoacetate. It is a completely organic compound and is a surfactant, conditioning agent, and foam booster derived primarily from coconut oil. It also assists with cleaning of hair and especially removal of dirt. Damaged Hair: The Enjoy luxury shampoo works wonders on damaged hair. Sometimes, coloring of hair can cause damage to hair strands or follicles and this shampoo helps in restoring hair and protects hair from future damage. This is a sulfate free plus thickening shampoo and conditioner for color treated hair infused with refreshing ingredients. The Advanced haircare formula of this luxury enjoy hair care shampoo absorbs into hair to weightlessly smooth and add shine. It is also specially formulated for fine hair to add thickness to it. Besides it is very gentle enough for color-treated or permed hair, It is most popularly used as a detangler shampoo and conditioner, hair thickening shampoo, hydrating conditioner and strengthening shampoo. Assists with detangling of hair and helps in strengthening of hair follicles and thickening of hair strands. Not only color safe but also provides proper nourishment and helps moisturize dry hair so that it looks and feels silky and smooth. 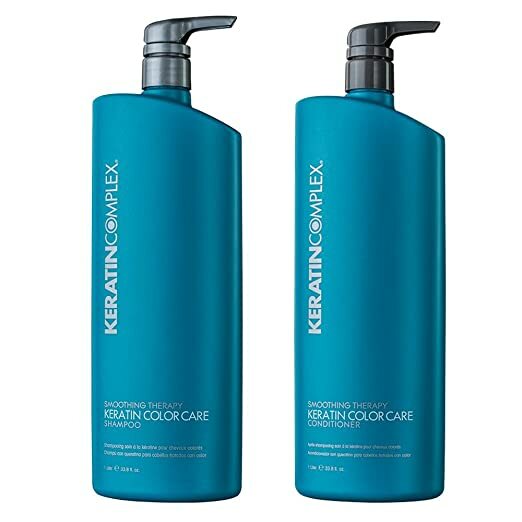 Why is the Keratin Complex smoothing therapy shampoo considered the best shampoo for colored hair? It is simply because it is not just a shampoo but a complete system that has been created to ensure your hair gets the very best of treatments. It is absolutely safe for colored hair and has been designed to complement almost every type of hair. As the name suggests, the primary ingredient is Keratin. Keratin is a type of fibrous structural protein and its primary role is to protect epithelial cells from any kind of stress or damage. It is an important structural component of human hair and provides toughness and strength. Keratin treatments are recommended mostly for smoothening of hair. This is exactly what the Keratin Complex smoothing therapy shampoo does apart from the fact that it is also the best shampoo for colored hair. Protect and Rejuvenate: The Keratin Complex smoothing therapy shampoo is a complete therapy in itself as it not only helps in protecting the hair color from stripping off but also ensures your hair regain its luster after every rinse or wash.
Acts as a mild cleanser, which has been specially formulated for providing long lasting smoothness to color-treated and keratin-treated hair. Can be used on all types of color-treated hair including dry, damaged, and entangled hair. Cleans gently without stripping off hair color. Available in a three-protein blend condition composition that minimizes flyaway’s and frizz thus leaving your hair looking smooth and shiny. Free from sulfates and sodium chloride and hence is extremely safe for color treated hair. The ORIBE Shampoo for beautiful color comes in a neat deep wine colored bottle that looks more or less like a bottle of eau de parfum. This is one shampoo that had to be on the list of best shampoo for color treated hair as this ultra gentle cleanser is meant to keep those color streaks on your hair shine for a long time. Whatever hair coloring you apply or any dye, the ORIBE shampoo contains ingredients that will not only protect but will also be safe for colored hair. One of the main ingredients that make ORIBE Shampoo the best shampoo for color treated hair is Bioflavonoids. Wondering what Bioflavonoids are? They belong to the family of antioxidants and play an essential role in absorbing vitamin C. Bioflavonoids have been used for the treatment of hair loss and now ORIBE Shampoo uses this amazing ingredient to protect your hair color from discoloration or fading. It also contains watermelon extract that is brought to your straight from the African Kalahari Desert. The role of this extract is to provide a natural protective cover for your hair against oxidative stress. It also helps in minimizing the deterioration of keratin that is available naturally. The ORIBE Shampoo for beautiful color contains several natural and potent ingredients including Baobab tree extract, Bioflavonoids, Kaempferia Galanga root extract, watermelon extract, and Edelweiss flower extract. 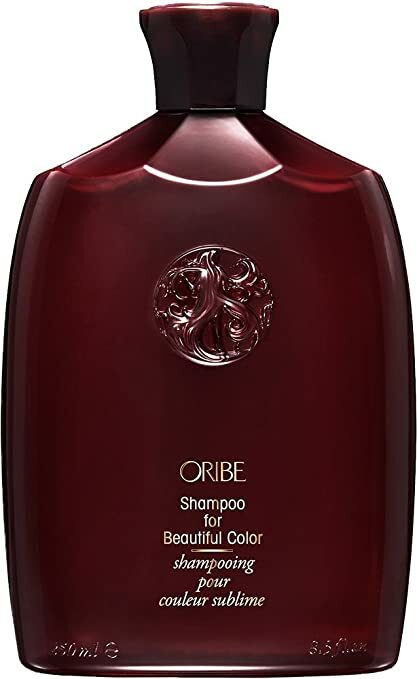 ORIBE Shampoo for beautiful color comes with the ORIBE Signature Complex, which is essentially a blend of several natural ingredients including Edelweiss flower extract, watermelon extract, and Lychee extract. The ORIBE Signature Complex system makes this shampoo safe for colored hair. The patented system also protects hair from photo-aging, drying, color depletion, oxidative stress, hair follicle damage, and deterioration of keratin. Acts as a gentle cleanser and has been specially formulated for providing long lasting smoothness to color-treated hair. Contains natural ingredients helps in preserving hair color. Free from sodium chloride and parabens and hence is extremely safe for color treated hair. Created using a Multi-Layered UV Protection System that is able to protect your hair from UV radiation effectively and thus minimizes discoloration, dryness, and damage. 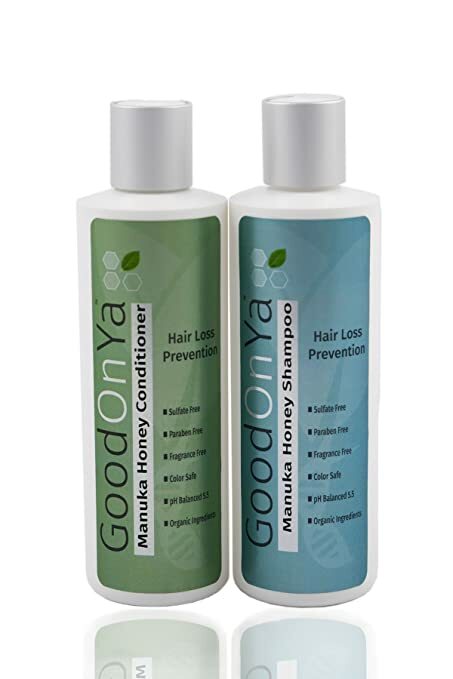 The Good-On-Ya Manuka Honey shampoo has been created keeping in mind one single aim, which is to effectively clean your hair and ensure restoration of natural beauty with stripping of the hair color. GoodOnYa based out of Tampa, Florida specializes on spa, beauty and personal care including hair care. If you have been searching for the best shampoo for colored treated hair then this is something that deserves a try! Is there any magic formula that makes the Good-On-Ya Manuka Honey shampoo safe for color treated hair? It is not a magical ingredient but is available naturally and is known as manuka honey. The name "manuka" is derived from the fact that this honey is being produced by those bees that pollinate New Zealand's native manuka bush. Honey has been known since ages to have antibacterial qualities and healing powers but now, the manuka honey from New Zealand has proven to be a highly potent protective armor for your hair. The honey used in the shampoo is medical grade Manuka Honey. No water: The Good-On-Ya Manuka Honey shampoo doesn't contain water and is available in a concentrated form with a balanced pH of 5.5. This provides protection to hair from damage and makes it safe for color treated hair. Good-On-Ya Manuka Honey shampoo is currently on fifth position on the list of best shampoo for color treated hair. Acts as an effective hair cleanser that provides relief from itchy or dry scalp and prevents Seborrhea or Seborrheic Dermatitis. It is not always that easy to find a good shampoo where good determines the type of nourishment for scalp, amount of protection to hair, and whether or not, it is safe for colored hair. When it comes to the Bosley Bos Revive nourishing shampoo, it delivers all that is good for your hair. This is exactly the reason why it is on our list of best shampoo for color treated hair. You are probably wondering what is the formula or special ingredient that makes Bosley Bos Revive nourishing shampoo so popular! Formulated specially for providing nourishment and invigorating hair and scalp, the Bosley Bos Revive shampoo contains Planktons extract. It is a marine species also known as the Thalasso plankton and has been derived from a variety of seaweed, algae, and marine skeletons. Planktons extract have been in use for decades for skin treatments and can now be used for hair as it acts as a smoothning agent and helps in protecting your hair from photo-aging and damage. LifeXtend Complex with Saw Palmetto: The Bosley Bos Revive nourishing shampoo contains a patented system and blend of natural extracts that hydrates the scalp, nourishes hair and roots, fortifies, and strengthens scalp and hair to make it look fuller. 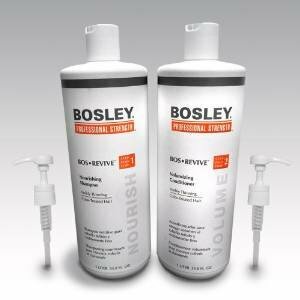 Non Toxic: The Bosley Bos Revive shampoo and conditioner are both sulfate free and don’t contain any other toxic chemicals that can cause severe damage to your scalp, hair or follicles. Bosley nourshing shampoo is the last shampoo in the list of 6 Best shampoo for color treated hair. Gentle cleanser that helps in removal of toxins like DHT, which cause hair loss and thinning. Pentapeptide, one of the several ingredients stimulates the production of Keratin Protein, which helps in strengthening of roots. Contains Soy Amino Acids, which helps in restoring the thickness, strength, and volume of hair. This nourishing shampoo contains ColorKeeper, which is not only safe for colored hair but also extends the overall longevity of your hair color. Getting your hair colored is not just about making a fashion statement; it sometimes simply makes you feel good. Some people use chemicals while coloring hair while some use natural ingredients but whatever it is, the last thing you want is to lose the color. This is where you need to make an informed choice and pick up the right shampoo and this list of best shampoo for color treated hair will help you do just that!